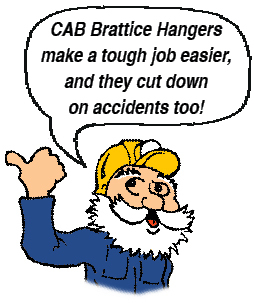 CAB Brattice Hangers are designed to quickly and easily suspend brattice cloth from the mine roof. Sharp offset tip keeps brattice tight to the roof. Made from .187 (4.7mm) wire, 7″ (178mm) long with 1-1/8″ (29mm) or 1-1/2″ (38mm) diameter hole. For proper installation, hanger must be placed on end of roof bolt between the plate and the roof of the mine.